Both industrial engineers from NC State. Both from small North Carolina towns. Both highly successful businessmen. Edward P. Fitts, Jr. and Edgar S. Woolard, Jr. began a friendship based on their mutual love for NC State, their appreciation of the paths that their engineering degrees started them down and a common goal: to make the University, the College and the department where they studied the best that they can be. I’ve always wanted NC State to be number one in everything that we do. “I’ve always wanted NC State to be number one in everything that we do,” Ed Fitts said. Their work for NC State took different but equally important paths. Ed Woolard began his contributions in the early 1980s, working as an advisor to NC State chancellors, serving on the University’s Board of Trustees and helping lead two University capital campaigns. Fitts “burst on the scene” — as Woolard puts it — with a vision to make the Department of Industrial and Systems Engineering one of the top five industrial engineering departments in the country. 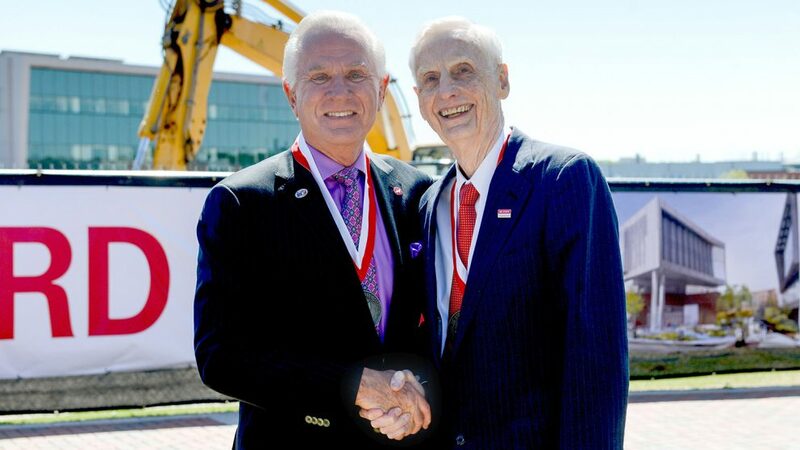 In 2005, he made a $10 million transformational gift that named the department, and he has been instrumental in the fundraising efforts for the College’s newest building on Centennial Campus. The two Eds returned to campus in April 2018, when the University named that building Fitts-Woolard Hall. 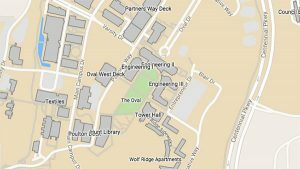 Their $25 million gift to help fund construction is the largest gift given to a campus building naming in NC State’s history. It’s a tale of two people participating in the university we love, and we give it great credit for what we learned about how to succeed as engineers and businessmen. The future home of the Edward P. Fitts Department of Industrial and Systems Engineering; the Department of Civil, Construction, and Environmental Engineering; and the dean’s administrative offices will further the College’s move to Centennial Campus. It will also leverage the power of convergence across disciplines, forming one of the world’s most dynamic research and education environments. For Fitts and Woolard, it was a move that had to be made. The College has committed to raising $60 million in private donations to help fund the $154 million project. “The key in my mind from day one was that we make certain that we raise the money that we need to meet our commitments,” Fitts said. The $25 million gift has taken the College a long way toward reaching its fundraising goal. But the work is not complete, and Fitts and Woolard hope that more alumni will follow their example and provide support so that the College will not have to borrow to complete construction. “We still need to raise another $12.8 million to meet our commitment to the state, and that’s very important to us as well,” Fitts continued. friendship, which started with a breakfast meeting in Jupiter, Fla., 13 years ago, has been very beneficial to the College, their home department and to them. “It’s a tale of two people participating in the university we love, and we give it great credit for what we learned about how to succeed as engineers and businessmen,” Woolard said. Fitts knew what he wanted to do, he just wasn’t sure how to do it. So, he called on someone who could help. A native of Littleton, NC, Fitts earned his B.S. in industrial engineering in 1961. After graduation, he went to work with Sonoco Products Company, rising to the position of vice president of paperboard packaging. In 1979, he purchased Sonoco’s folding carton operation, renamed the business unit Dopaco Inc. and turned it into the number-one fast-food packaging company in the world. Fitts endowed his first scholarship in industrial engineering in 1999 and his first professorship in the department in 2002. But he had plans for something bigger. He wanted to make a sizable donation to support industrial engineering and tie it to a business plan that would help transform it into one of the top five such departments in the United States. Having just reconnected to the University, he wasn’t sure how to implement such an audacious plan in an academic setting. So, he called on Ed Woolard. 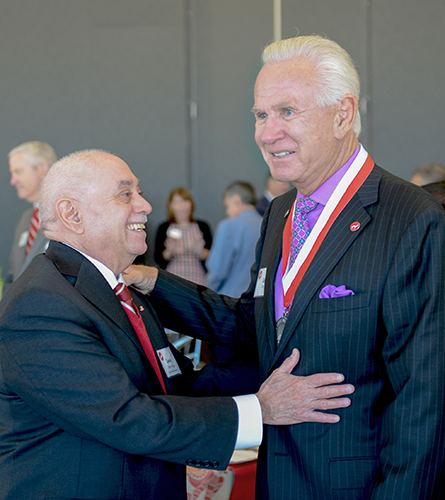 After graduation with a bachelor’s degree in industrial engineering in 1956, Woolard began a career with DuPont that would see him rise to president, CEO and chairman of the board. Then, as chairman of the board at Apple, the Washington, NC, native famously brought the company back from the brink when he convinced Steve Jobs to return in 1997. As he rose to the top echelons of DuPont, Woolard worked as a close advisor to Chancellors Larry Monteith and Marye-Anne Fox, who asked him to co-chair the University’s Achieve! campaign. That campaign, NC State’s first to raise $1 billion, was an important turning point, Woolard said. The two had never met in school or in business, but both had homes in Jupiter, Fla. Fitts asked Woolard to meet him for breakfast to discuss his plans to donate $10 million to their home department. Woolard agreed to be part of a committee that included a couple of Fitts’ business associates and an engineering faculty member from Georgia Tech. In developing a plan for how the donation would help transform the department, the group looked at its strengths and weaknesses. They examined where the field is headed in the coming decades, from healthcare and medical logistics to the Internet of Things. 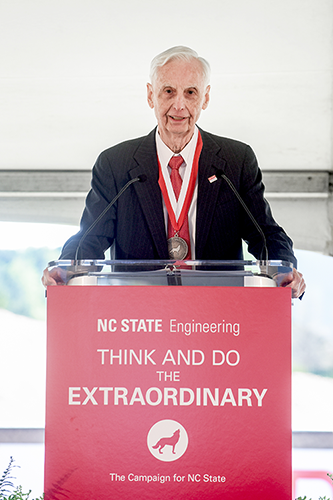 In 2005, the Edward P. Fitts Department of Industrial and Systems Engineering became the first named academic department in NC State’s history. Thanks to Fitts’ $10 million donation, which became a $12 million gift to the department with matching funds from the state of North Carolina, the department has risen in national rankings and has nearly doubled in size in the last decade. The committee knew that a new home for the department would be part of the plan. But the first investment was in scholarships, fellowships and named professorships. With a new department head and talented new faculty members in place and more scholarship and fellowship opportunities for top students, a new home to replace aging Daniels Hall would bring it all together and help the department achieve its full potential. Fitts-Woolard Hall will not only give faculty members and students the best facilities, it will put them in a cross-disciplinary collaborative environment on Centennial Campus with other engineering departments and some of the world’s top companies. More than 300 alumni and friends have made commitments to support the building. Fitts and Woolard hope that many more alumni will sign on to help raise the additional $12.8 million, people who, like them, know the importance of an NC State engineering or computer science degree and appreciate all it has done for them.